I have put some older pics of my car and the current ones just now taken with video in my friends back yard where the car is currently sitting. i am selling my Porsche as i will be taking a long traveling vacation. iv owned this car about 5 years. i have rarely driven it to be honest. just have many other cars/motorcycles. i have drove it maybe total 1000 miles locally and 200 miles since the NEW MOTOR WAS INSTALLED FREE OF CHARGE FROM PORSCHE DIRECTLY BY PORSCHE DEALER WITH FACTORY MOTOR. i was told Porsche was charged over 20k for removal and install of the motor. done at dealer Braman Porsche of west palm beach. 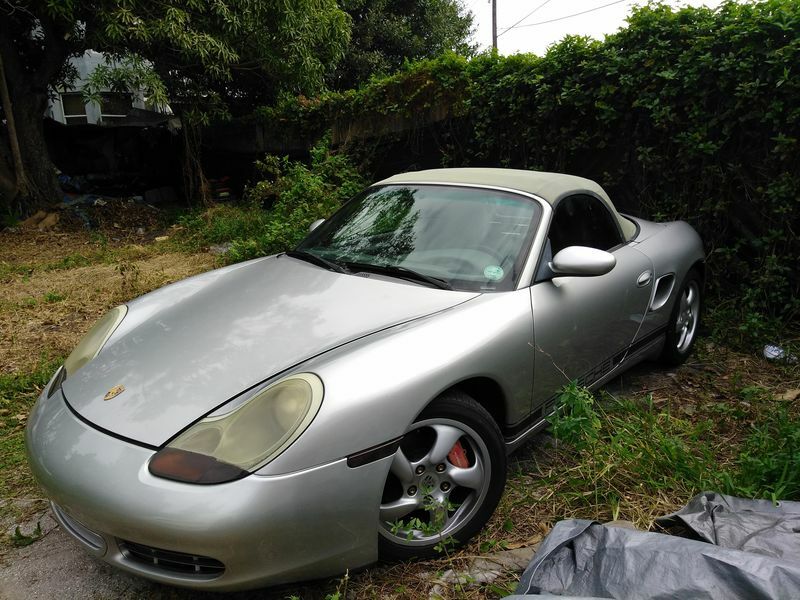 my car was part of the Porsche settlement where they had to replace motors in only certain boxster s types. the car ran fine before except for a problem it still has where the it shows the MAF mass air flow sensor needs to be replaced. not expensive part but what the problem really is is that the computer needs to be reflashed. it just runs now the maf is disconnected. the previous owner drove the Porsche like this every day and was his daily driver. I drove it like that but thought id fix it. i was upset with Porsche that they didn't fix it but they said they were only replacing the motor not computer. should be able to do it for free if complain to them im sure. but im selling as is and as you see in the video the car runs and drives and was able to go down i95. this car really is a pleasure to drive, mid engine boxter S engine. this is a real S type. that option that has some 911 options on it alone cost more then im asking for the entire car. body still has low miles at 92k. NEW MOTOR only has 200 miles. 2000 PORSCHE BOXSTER S 986 v1. triptronic auto transmission. s type option was more then im asking for the entire car. S type option upgrades the motor from a 2.7 to a 3.2 and bumps up to over 250 hp stock. this car is closer to the 911 with the s option and uses 911 rims. 93k miles. silver. no accidents, good carfax. 93k miles on body and less then 1k miles on replaced motor from Porsche!! which makes this a steal. also listing on ebay. the car fax score was way above avg. no accidents , clean open FL title.